In this video we will discuss how to debug stored procedures in SQL Server. Unable to start T-SQL Debugging. Could not connect to computer. To fix this error, use the computer name to connect to the SQL Server instead of using (local) or . For the examples in this video we will be using the following stored procedure. 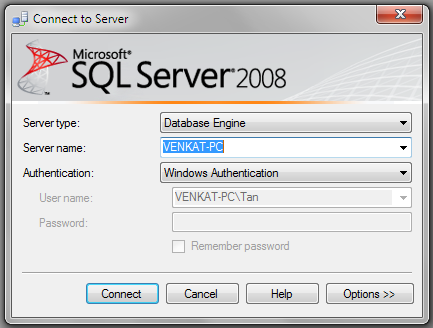 Connect to SQL Server using your computer name, and then execute the above code to create the stored procedure. At this point, open a New Query window. Copy and paste the following T-SQL code to execute the stored procedure. 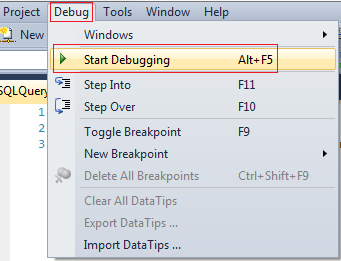 Step Over, Step into and Step Out in SSMS : You can find the keyboard shortcuts in the Debug menu in SSMS. 2. On LINE 3, we are calling a Stored Procedure. 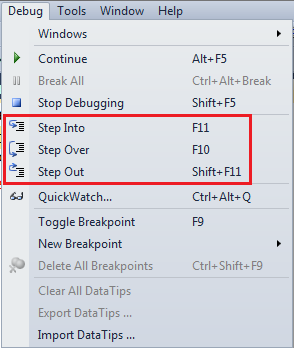 On this statement if we press F10 (STEP OVER), it won't give us the opportunity to debug the stored procedure code. To be able to debug the stored procedure code you will have to STEP INTO it by pressing F11. 3. If the debugger is in the stored procedure, and you don't want to debug line by line with in that stored procedure, you can STEP OUT of it by pressing SHIFT + F11. 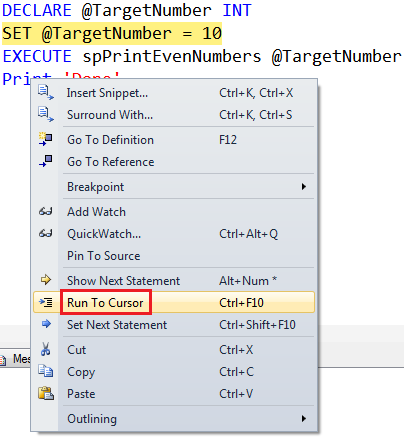 When you do this, the debugger completes the execution of the stored procedure and waits on the next line in the main query, i.e on LINE 4 in this example. Show Next Statement shows the next statement that the debugger is about to execute. If you cannot see the locals window or if you have closed it and if you want to open it, you can do so using the following menu option. Locals window is only available if you are in DEBUG mode. 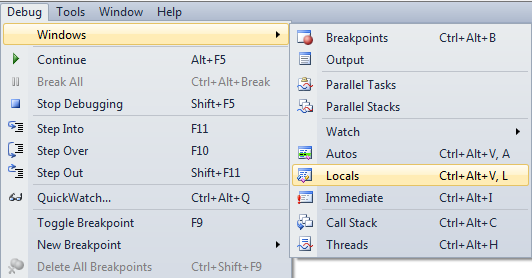 Watch Window in SSMS : Just like Locals window, Watch window is used to watch the values of variables. You can add and remove variables from the watch window. To add a variable to the Watch Window, right click on the variable and select "Add Watch" option from the context menu. Call Stack Window in SSMS : Allows you to navigate up and down the call stack to see what values your application is storing at different levels. It's an invaluable tool for determining why your code is doing what it's doing. Immediate Window in SSMS : Very helpful during debugging to evaluate expressions, and print variable values. To clear immediate window type >cls and press enter. 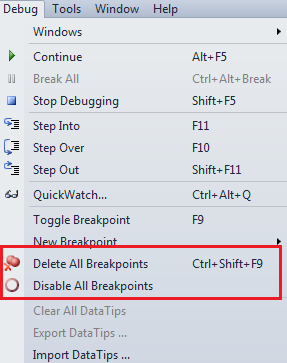 Breakpoints in SSMS : There are 2 ways to set a breakpoint in SSMS. 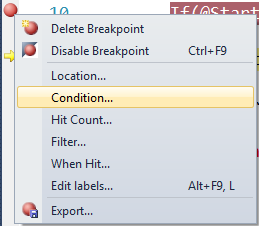 Conditional Breakpoint : Conditional Breakpoints are hit only when the specified condition is met. These are extremely useful when you have some kind of a loop and you want to break, only when the loop variable has a specific value (For example loop varible = 100). Thank you so much for keep posting videos on sqlserver.Can you please tell me how to pass mutiple values as parameters to a stored procedure(say 1000).This is one my interview questions. Thank you so much for keep on posting the videos on sqlserver.Can you please record the video for passing multiple values to stored procedure(say 1000).This is one of my interview questions. I am not exactly sure but by referring previous videos i think it can be done by passing table valued variable to procedure.